I’m probably one of the very few people who enjoy the process of purchasing a new car. Not that I have a lot of practice. We purchased our first new car in 1997, and have purchased a whopping three cars since then. I also do not have all that much experience with purchasing new motorcycles, which seems a bit odd since I’ve ridden more than 500 of them, most of them new. 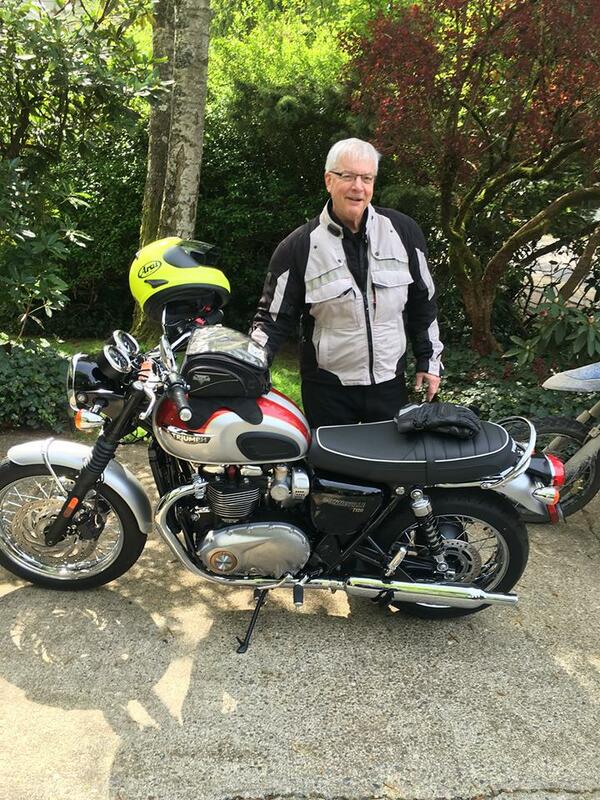 Although I purchased several new motorcycles in the almost ten years I worked at Cycle Barn, all of them had some sort of delectable friend of the dealership or promotional consideration string tied to them. The rest of the new bikes were rental bikes, test bikes, demos, or those purchased by the dealership for my own use. The first part is the research, which is the most important part of the process, and the most fun. Once the decision has been made, or forced upon us, I dive into the amassing of a wealth of printed and on-line information, which is pored over and studied ad nauseum. In addition, we went to the Seattle auto show last month, and had a wonderful time looking and sitting in some of the contenders and discussing our individual preferences. We’ve decided to replace our 2005 Honda CR-V. At 90,000 miles, it has a lot of life left in it, but there are various small mechanical and electrical issues to be addressed, and we can afford a new one – within reason. The good news is that the small SUV niche of the market is currently the “hottest,” and virtually every manufacturer offers their iteration on the theme. The bad news is that almost all of them follow the same formula, so gleaning the winner from a tidal wave of hopefuls can be confusing. Prices range from about 25k to well over 100k. We will be focusing more toward the lower end of that range. To generalize, we’re looking at a 4 or 5 seat small SUV. It will have a 4 cylinder engine that may or may not be turbo charged. It will have either on demand four wheel drive or permanent AWD. Since so many of them are so similar in spec, we can first toss out those that we do not find attractive. On the one hand, the appearance of a utilitarian vehicle should not make that much difference, but if I am going to spend over 35k on a vehicle, it needs to be one I really like. Susan has her preferences as well – it needs to be black. Due to the subjectivity of appearance the Mazda CX 5, which seems to win most of the published comparison tests, was ruled out. I just don’t like how it looks. Same with the Hyundai Tucson, the Buick Envision, the Chevrolet Trax, the Mitsubishi Outlander, and even the Honda CR-V, although ours has served us well. The field is getting smaller already! Others were knocked off the list by price. I REALLY liked the Audi Q3, and argued that this might well be the last car we will ever purchase, but Susan is worried about what might happen to our IRA funds and Social Security under the reign of the idiot my peers have elected to be President, and her caution is warranted. So all the contenders likely to soar over 40k are gone. Now we’re down to a manageable few. As personal preference, I dislike CVT transmissions. Intensely. I’ve driven my daughter’s Subaru Forester, and the CVT drove me wild. It accelerates from 0 to 10mph in a jerk, and then falls on its face. I was pleased to see several printed references to the same problem. It’s not just me! So all Subarus, great cars that they are, were summarily booted off the list. I’ve read that CVT is some other brands are not as bad, but I’d prefer a good old automatic. Some of the contenders are still available with a manual transmission, but only in the “stripper” models. Because we’re older and retired and no longer have to pinch all of our pennies, we’re looking for a top of the line model of whatever. We both love a sunroof, for example, and opting for a sun roof in most of them shoots you to the top model in one step. But wait, there’s more. Some cars have the sunroof set so far back it almost does not count, which weighed again the Mazda, for example. We’re not that enamored of high end stereo systems, and nav would be nice but not really all that necessary. However, most of the finalists have both at the options level we’re interested in. Oh well. So the short list, after three months of research, comes down to three. The Ford Escape, the Kia Sportage, and the VW Tiguan have made it to the finals. Here’s where research pays off. The Ford Escape was at the top of my list for a long time. I think it looks sensational, and the reviews are positive. We liked the one we sat in at the show as well. Last week we stopped by Ford of Kirkland to look again, and it did not go well. The salesman failed to impress. When we told him we were there just to sit in the car, he lost all interest in us, even though I told him we would be purchasing a car before the end of the year. Maybe we looked poor. Much worse, the one of the showroom floor was a loaded model, which comes with larger wheels. I had not realized how big this car is! Not by most folk’s measurements, but by ours. Every time I’ve seen once since it seems to get larger. This has to be an optical illusion, because by the numbers it is about the same size as the others. However, perception is so often reality. In addition, the windshield is a LLOOONNNG way from the driver, which is a pet peeve of mine. The further away the glass the more obstructive the bug guts are. Evidently this is my personal bugaboo. I mentioned this to a friend and he said “Yes, and nobody gives a crap.” Probably true. The Kia Sportage is saddled with a dumb name, but impressed us greatly at the show. All the spec we want, and a decent price. We have yet to visit a dealership. We were early for one of my PT appointments last week and chose to stop by the Totem Lake VW dealer to try on a Tiguan. The example on the showroom floor aced every one of our criteria! Leather interior, forward sun roof, windshield within reach, and on and on. A tad expensive, yes. The salesman was Bob Hansen, and he was very impressive. At my request he e-mailed me several PDF’s with enough data to keep my head spinning for a few days. Up next is a visit to a KIA dealer, and then more pondering. We will purchase the last week of the year, when dealers tend to want to pad their annual sales totals. Who will win? Stay tuned for Part II! This entry was posted in Cars, Equipment, Marketing. Bookmark the permalink. I’ll be watching. We’re probably needed to replace an aging PT Cruiser that I keep resuscitating. BTW, you might want to update your profile. It still has you working, etc.